Vysoce výkonný startér pracuje na magnety a ne na vynutí (delší životnost). Má menší potenciál rušení a je také lehčí než originál. Stertér je vhodný nejen na laděné motory, ale také na standardní. Pouzdro je součástí dodávky (Ø hřídele 11.0 mm). Starter high power 12 Volt 1.4kW (axle Ø 11.0 mm). If your engine will deliver more power is often difficult to start. 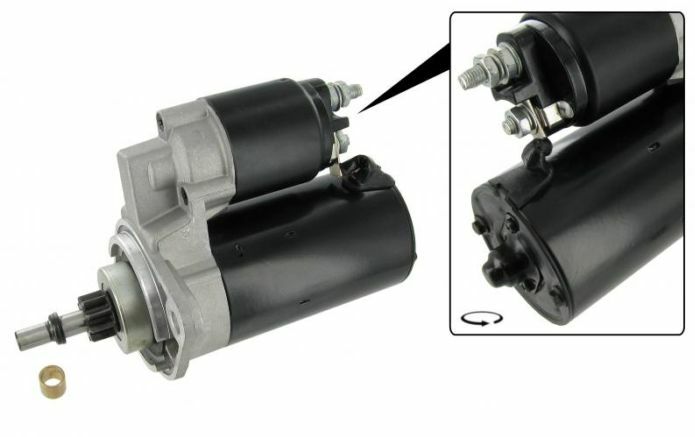 Because the compression in the majority of cases has been changed, the original starter here is difficult and sometimes not at all through turning. Previously, this 6-volt starter motor used on 12 volt circuit to work. It will help you sail through the compression stroke back but your 6 volt starter wear once so hard so you had to buy a new regular. With this high-power starter you have the correct item in good hands for a powerful starter motor to have. This starter only works on 12 volts, has a powerful 1.4 Kilowatt engine (original is 0.7 kilowatt), works on magnets and not with windings which a smaller potential for interference with a longer life and he weighing about two pounds lighter than the original which on the circuit is important. Of course not only for tuned engines but also for standard engines a perfect solution for a fast starting car. Comes with a standard starter van. The shaft diameter is 11.0 mm.